University of Hawaii Press, 9780824833794, 227pp. 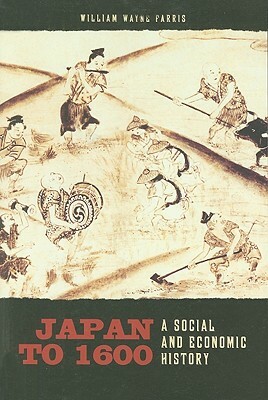 Japan to 1600 surveys Japanese historical development from the first evidence of human habitation in the archipelago to the consolidation of political power under the Tokugawa shogunate at the beginning of the seventeenth century. It is unique among introductory texts for its focus on developments that impacted all social classes rather than the privileged and powerful few. In accessible language punctuated with lively and interesting examples, William Wayne Farris weaves together major economic and social themes. The book focuses on continuity and change in social and economic structures and experiences, but it by no means ignores the political and cultural. Most chapters begin with an outline of political developments, and cultural phenomena--particularly religious beliefs--are also taken into account. In addition, Japan to 1600 addresses the growing connectedness between residents of the archipelago and the rest of the world. Farris describes how the early inhabitants of the islands moved from a forager mode of subsistence to a more predominantly agrarian base, supplemented by sophisticated industries and an advanced commercial economy. He reveals how the transition to farming took place over many centuries as people moved back and forth from settled agriculture to older forager-collector regimes in response to ecological, political, and personal factors. Economics influenced demographics, and, as the population expanded, the class structure became increasingly complex and occupational specialization and status divisions more intricate. Along with this came trends toward more tightly knit corporate organizations (village, city, market, family), and classes of servants, slaves, and outcastes formed. In reflecting the diversity of traditional Japan's economy and society, Japan to 1600 is well suited for both undergraduate and graduate courses and will be a welcome introduction to Japan's early history for scholars and students of other disciplines and regions.